Beyond Growth: a conversation with Ashish Kothari, Deepak Nayyar, and Ashok Khosla organised by Development Alternatives on 26th August 2013. How did we reach our current state? Until about 250 years ago, there was no concept of growth. There was a tendency to grow but it is not the kind of growth we talk about now-in per capita income terms. The discipline of economics, which has guided us for so long, was born somewhat from mercantilistic imperatives and was influenced by the success in its theoretical frameworks and by the success of the physical sciences- in terms of its methodologies and its qualifications and search for quantification, and so on. Over the past 250 years the conditions that generated this discipline have changed. They are no longer valid and many of them have changed radically, though the discipline itself hasn’t always noticed those changes. They were based on the assumptions that resources were infinite, that the environment had unlimited absorptive capacity for our wastes, that the human creativity was completely unending and could absolve all problems. And all these were very useful in the first couple of 100 years in transforming the global economy. But in 1972, the Club of Rome published a report called the Limits to Growth, which actually questioned for the first time, in a formal large scale sense, this format that we are following. It basically stated that if we were to continue the way we were then there would be basically a collapse of our economic systems, of our natural resources and of our populations. This caused consternation especially in the economics profession. There was strong denial and rejection of the notion that there could be such a problem ahead and used the fact that the global economy, continued to grow at a huge rate for the next 30-40 years, to disprove the limits to growth. But in the year 2000 it was pretty clear that there were limits to growth- there were limits to growth in terms of resources, there were limits to growth in terms of connectivities, there were limits to growth in terms of social alienation and a hundred other things particularly relating to how people living in communities. Do we need a new development agenda? Given our experience over the past 25 years in India, in Asia, the world as a whole. It is time to reflect on a new agenda for development. In this reflection, the concern for efficiency must be balanced by a concern for equity. Just as the concern for economic growth must be balanced by a concern for social progress. The focus must be on people, rather than on countries- which is what the discourse in development has been following. And in this pursuit for development the importance of public action cannot be stressed enough. So we need to look beyond growth, in terms of why growth is not enough even in the limited domain of economics. The problem with growth is its focus on aggregates – GDP, National Income. But this focus does not recognize the important question- Growth for whom? Growth for what? Growth can be inclusive if and only if it creates employments, it creates livelihoods. Growth alone is not enough because the benefits of growth accrue in a very unequal manner to people, sectors, regions within countries. But this is not to sat that economic growth is not necessary. It is necessary because without growth, without increments in output, it is the poor who will go without anything, not the rich. But growth must not increase inequality. Therefore, economic outcomes should be moderated by social policies or maybe markets decide what’s most efficient and if there is an outcome that is socially undesirable we should correct it with social policies. This distinction and dichotomy between economic and social development – is not just inappropriate, it’s unsustainable. If you look at the history of industrial societies, there was never a separation, there was always integration. So you really need to develop institutional mechanisms that mediate between economic growth and social development. Albeit the dominant ideology of our times is still so obsessed with economic growth that there is no concern with the triple bottom line and inclusive growth is no more than empty words. It is essential then to contemplate a world beyond growth in which the well-being of people as individuals in terms of rights, capabilities, and opportunities is a critical dimension which is must be stressed upon. But, in which the well-being of people as a society in terms of ecology and environment is another critical dimension which is just as important, given that we may be heading for an ecological collapse. Are there alternatives that exist? 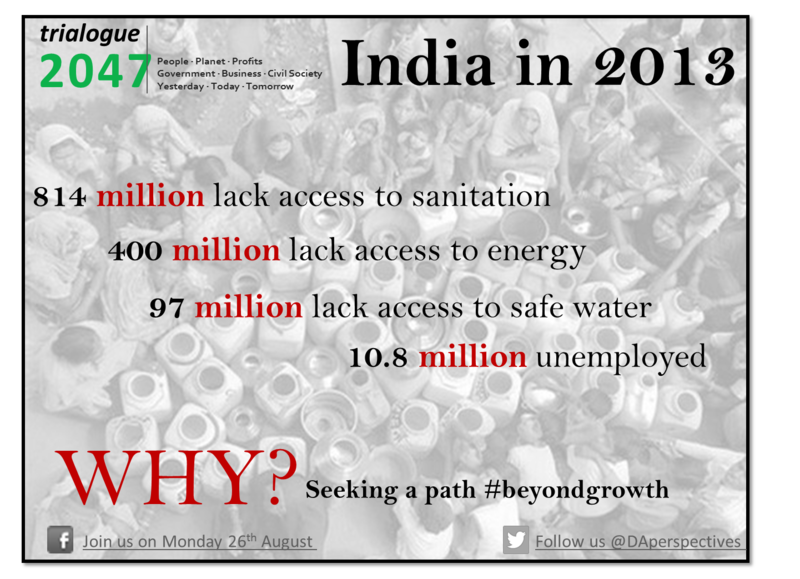 The above discussion raises an important question for the world and for India is – Are there other alternatives? Are there other ways in which genuine needs of people, aspirations of people and especially those people who have been left out- who are deprived, who are in destitution, in hunger or poverty, can be met? Are there ways by which their needs and aspirations can be met without generating the kind of problems that economic growth has brought us today? Where are we headed? If we talk about 2047- where is India headed? Is it going to continue down the path of destruction, inequalities and suffering? Or is going to pick up on the new trends and maybe forge some new paths? The crisis that are engendering and will further engender, there will be the saplings of answers or different pathways that will be emerging, which are already present right now but which we as a society need to nurture. Even if they are small and tiny, we need to be able to nurture so that we can survive from this collapse and emerge from that and create the pathways that will lead us to a sustainable and equitable future. If we look at the whole range of things that are happening, in India and elsewhere, we are looking at avery different framework of society, economy and polity than the one we have right now- the radical ecological democracy. The essential elements of which are -very direct, radical, grassroots democracy and embedded institutions which actually build into larger landscapes. But where power emanates from the grassroots and not the other way around. Its has elements of economic localisation and economic democracy (which doesn’t necessarily mean everything is localised), the controls lie with the producers and one can build larger trade systems based on those controls. Elements of democratic knowledge, democratic technology, generation and transmission are all parts of what could be an alternative framework. But the crucial aspect of that is not just the how to, not just the technologies but really grasping the underlying values and principles, which are very different from our current dominant system. These are values which say that ecological sustainability has to be at the core of everything. These are values which say that equity and social justice have to be at the core of all decision-making and planning. These are values which say that diversity is something to be valued. The questions we need to think, to answer are – suppose if we do have these alternative pathways and visions and so on, some of which are already emerging on the ground, how do we get there? How do we actually beat the current system or change the current system? What are the political carriers of this kind of transformation? How do we connect all these different strands of peoples movements- the civil society movements, the policy changes, across the different movements?How do we put these together on platforms where they can learn from each other, challenge each other, actually form a critical political mass, that really challenges the system? If we can answer these, then maybe India 2047 is going to look very different from the currently depressing scenario that we have.